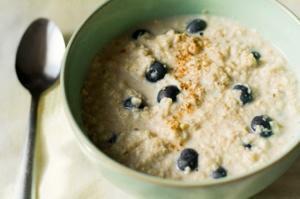 How Many Calories Are in Quaker Oats Oatmeal? How many calories are in Quaker Oats oatmeal? The answer depends on the product you choose, but all are a healthy, nutritious and low calorie meal for breakfast or a snack. In order to answer this question, you need to consider each of the various Quaker Oats products. Quaker Instant Oatmeal in original flavor has 100 calories per 43 gram packet. Quaker Instant Oatmeal in strawberries and cream flavor, Quaker Instant Oatmeal in peaches and cream flavor and Quaker Instant Oatmeal in apples and cinnamon flavor all have 130 calories per 43 gram packet. Quaker Instant Oatmeal in raisin, date and walnut flavor has 140 calories per 43 gram packet. Old Fashioned Quaker Oats, Quaker Instant Oatmeal in banana bread flavor and Quaker Instant Oatmeal in raisins and spice flavor all have 150 calories per ½ cup. Quaker Instant Oatmeal in cinnamon roll flavor, Quaker instant oatmeal in vanilla cinnamon flavor, Quaker instant oatmeal in maple brown sugar flavor all have 160 calories per 43 gram packet. Quaker Instant Oatmeal in cinnamon pecan flavor has 180 calories per 43 gram packet. Quaker Instant Oatmeal in honey nut and Quaker Instant Oatmeal in cinnamon and spice both have 170 calories per 43 gram packet. As you can see, there is a calorie range of about 70 calories per serving depending on the oatmeal product you choose. When considering how many calories are in Quaker Oats oatmeal, you may also want to consider their other oatmeal products, as well, which are a great source of soluble fiber and convenient for snacks on the go. Quaker Oatmeal to Go bars are individually wrapped oatmeal bars. One 60 gram bar has 220 calories. Flavors include raspberry streusel, oatmeal raisin, banana bread, apple cinnamon and maple brown sugar. The maple brown sugar bar has more fiber and weighs in with slightly fewer calories at 210. Quaker weight-control instant oatmeal packets have caloric counts similar to their regular oatmeal products. If you are looking to control your weight, knowing how many calories are in Quaker Oats oatmeal is a great way to monitor your caloric intake.